Not sure what procedure you need, if you even need the procedure, or just have questions about your teeth? Ask us for FREE! Now that we all know about how great implants are… what is the catch? 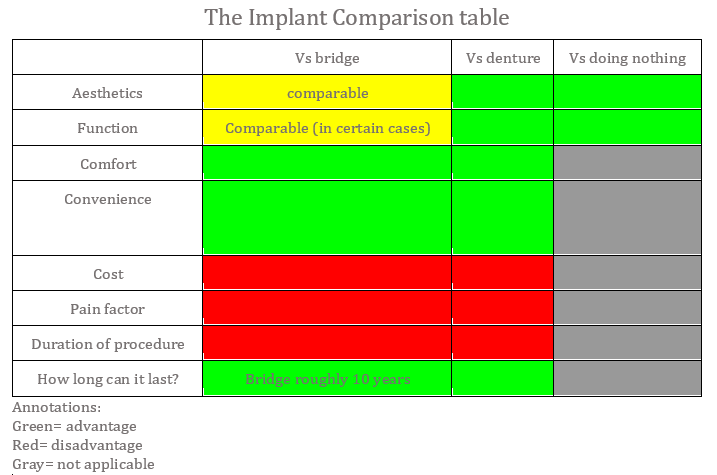 Here is a helpful table comparing dental implants to other common alternatives, namely, dental bridges and dentures. Nothing is all sunshine and rainbows, and there will always be pros and cons. So what, if any, are the disadvantages of doing implants? First, let's look at what you - the patients,- are concerned about. Take a look at the table above. I have shortlisted what I think patients are most concerned about. I shall be upfront here: implants are not cheap. They are more costly when compared to bridges and dentures. A single implant routinely costs at least $3000-$4000. The high cost is a reflection of the procedure and materials- basically, good things don't come cheap! In today’s age, time is of the essence. Everyone is busy with something: jobs to attend to, families to take care of, somewhere to go to. Patients want immediate gratification, and this means wanting fast and quick dental services. Why would anyone want to spend time making multiple visits to the dentist?! Unfortunately, for conventional implants to be done, you will have to make several visits to your dentist. You may also have to wait up to 4-6 months before finally getting them. Wait, you say, aren’t there so many dentists advertising immediate implants? What are those? Compared to bridges and dentures, the implant procedure is more uncomfortable and painful. The process involves a minor surgery to place the implant fixture into bone, followed by a healing phase of a few months. The surgery itself is largely painless. It will be carried out under local anaesthesia and you should not feel any pain. However, when the wound heals, you may experience post-operative pain and discomfort (just like in the healing of any other wound after surgery). You will be prescribed painkillers to help with the pain. The pain should subside after a few days and you will be back to normal. Generally speaking, implant surgery is a minor one and should not cause much problems. However, or patients who are squeamish and pain intolerant, this is one of the drawbacks of implants.. Whenever surgery is involved, there are potential complications and risks. Bridges and dentures do not require surgery, so they are ‘safer’ in that aspect. The main risks of implants surgery are injuries to the surrounding nerve and tissue. Injury of the nerve may lead to temporary or permanent numbness. It is a selective procedure, requires more steps. One of the basic prerequisites for implants is that there has to be sufficient bone. For many patients, this is not the case. The longer that the tooth has been lost, the less bone is available. Additional bone grafting measures may have to be done and this will take extra time and cost money. Click here for the complete guide to bone grafting. When an implant fails, repairing it is a difficult process. Because implants are made up of multiple individual components, problems may arise at each interface. Depending on which component fails, the repair cost and difficulty may vary widely. Many people think that with an artificial tooth, they can somehow be exempted from keeping it clean. This cannot be further from the truth. While not the only disadvantage specific to implants, implants are susceptible to failure if they are not kept clean. It is true that implants cannot get ‘decayed’ like normal teeth. Decay is caused by the bacterial infection of living tooth structure. Because implants are made of metal, they are impermeable to bacteria. However, the interface between the implants and the gums is where infections may happen. Over time, the underlying bone supporting the implant may recede. This causes the implant to be destabilised. In severe cases, the implants may start to become mobile and shaky. When this happens, the entire implant will have to be removed. Imagine that! All the time, effort, and money spent- only for the entire implant to be removed. So remember this- implants are not ‘invincible’. They require similar diligence in maintenance and cleaning. Need Help Finding the Right Implant Specialist? Let us help you! We will look through our database of specialists and find the one most suited to your needs!